The 5 to 6 percent of Arizona voters who live outside metropolitan counties backed the winners in both parties. The big contest in Tuesday’s primary schedule was Arizona. It had more delegates at stake than the other two states on the agenda, Utah and Idaho. People voted in Arizona. In the other states, people caucused. 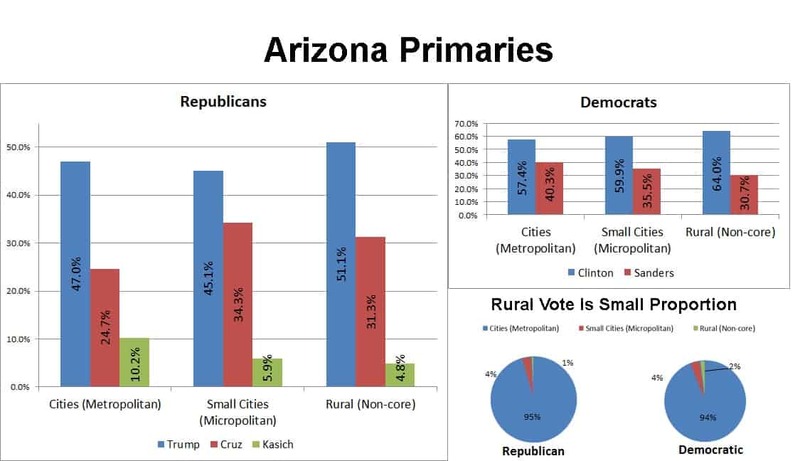 Rural voters in Arizona did differ from their urban neighbors. Rural Democrats voted for Hillary Clinton in higher percentages than urban residents. Over 60 percent of those living in rural counties and in small towns favored the former Secretary of State over Senator Bernie Sanders. In metro counties, Clinton won 57.4 percent of the vote. And on the Republican side, both Donald Trump and Senator Ted Cruz took a higher percentage of the vote in rural counties than in the cities. Rural residents were less likely to vote for those who had dropped out of the race, such as Ben Carson and Senator Marco Rubio, and for Governor John Kasich. Both Trump and Cruz saw their percentages rise in rural counties. You can see the exact percentages in the charts at the top of the page. Rural counties lie outside metropolitan areas and have no town larger than 10,000 people. Micropolitan counties have towns between 10,000 and 50,000 people. Idaho held caucuses, but only for the Democratic Party. There, Sen. Sanders won nearly eight out of 10 votes. Sanders, however, saw his support drop a little as the precincts became more rural. 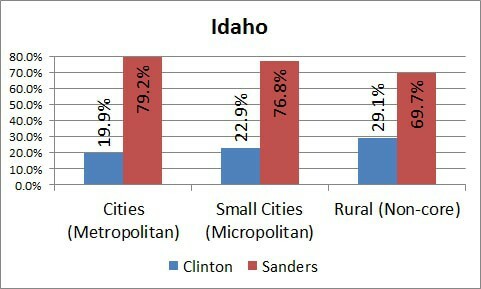 Clinton won about 20 percent of urban caucus-goers, but took 29 percent of those voting in rural Idaho counties. 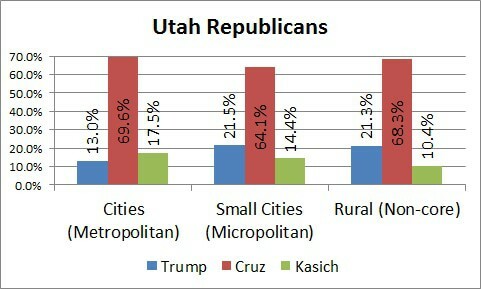 In Utah, Cruz swept the state’s Republican caucuses, winning nearly seven out of ten votes. The Texas senator’s percentage was consistent across the geography of this solidly Republican state. Results from the Democratic caucuses were not complete by mid-morning Wednesday. How this story defines rural. This story uses the Metropolitan Statistical Area (MSA) system to define cities, small cities, and rural areas. Metropolitan areas (called “cities” in our charts) are counties that have a city of 50,000 or more. Metropolitan areas also include the surrounding counties (no matter what size their population is) if the counties have strong economic ties to the central metropolitan area. Small cities (micropolitan areas) are outside an MSA and have a city of 10,000 or more residents. Rural areas (noncore) are counties that are not part of a MSA and do not have a city of 10,000 or greater. There’s more (lots more!) on this topic over at the USDA Economic Research Service website.